So, you’ve got this amazingly beautiful eyeshadow palette. It’s got a myriad different shades. It’s beautiful. But it’s overwhelming you, because you only wear one color on your lids. You have no idea how to create such seamlessly blended looks with two, let alone three to four different shades. Not to mention, you don’t have a lot of time to spend on your eye makeup, because you have to be somewhere in thirty minutes. That was me, many many moons ago (except for the whole running late part – that’s a regular occurrence). I didn’t understand that eyeshadow blending required brushes and placement of colors that flatters the natural shape of the eye. 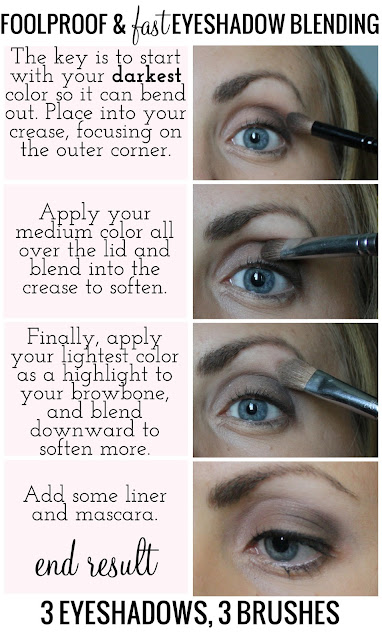 You always hear lid, crease, and browbone, but what makes them all look so nice and blended? 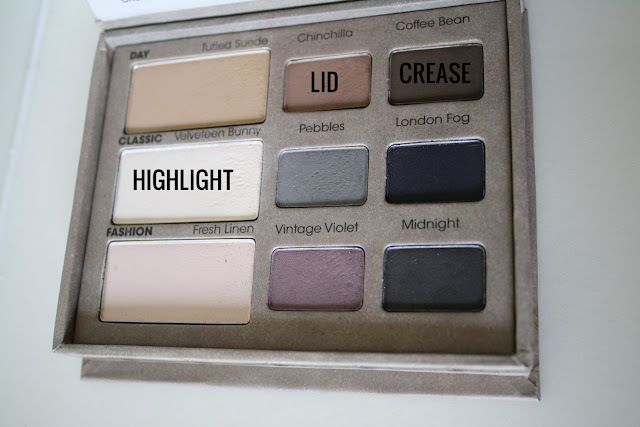 Most people always apply their lid, crease, and then highlight. I learned a few little tricks that has made blending a lot easier, time-conscious and overall so professional looking. Bear in mind, this is a neutral, daytime look. This is great for a work environment or if I need to look put together very quickly, and can easily be glammed up for the evening. All I’m using is 3 eyeshadows and 3 brushes to achieve this look. Now that’s what I call an eyeshadow blending tutorial. Am I right when I say you’ve got a mid-tone brown and a dark brown eyeshadow? And what about a highlight, perhaps if not white, you have a shimmery champagne? That works too! If I want more blending or a little more depth, I may add in the beige color (Tufted Suede) in the inner part of the lid and blend out a little more, but this is a 3 color, 3 brush tutorial, people. Why these three? The crease brush is a little fluffy and great to blend dark colors with, the lid brush is a bit smaller and perfect for putting color on the eyelid, and the highlight brush is large and flat, great for packing on light colors. Okay, so the absolute key takeaway here is to start with the darkest crease color. Why? So you can blend it out if you screw up, and then when you layer the other colors on top of it, it completely softens the look and looks far more blended with far less effort. The order is crease, lid, highlight. Stay light handed with it – you can always add more and blend as you go. I don’t know about you, but I often don’t have time to use clean eyeshadow brushes to blend out colors after I’ve placed them on my eyelids (yes, you’re actually supposed to do that), so by going in this order, it really saves time and effort. Let me break this down for you. So there you have it! Foolproof and fast! Foolproof because if you mess up, you just blend a lighter color on top of it, and fast because, well, it doesn’t take much time to do! Hollah!